Description The Aral Sea is one of less than 20 ancient lakes in the world, and is estimated to be more than 5 million years old. To many, the Aral Sea has become synonymous with environmental catastrophe. In the Soviet Union era massive amounts of water were diverted for irrigation of cotton and the lake began to shrink dramatically. At the same time, pesticides were being applied to fields in the watershed by airplane. The Aral Sea was the fourth largest lake in the world; it has now lost 90% of its source waters and two thirds of its surface area. Salinity has increased fourfold. Changes in the lake have caused local climates to change and desertification has increased, along with rates of respiratory diseases and cancers from salt and toxic-laden dusts. 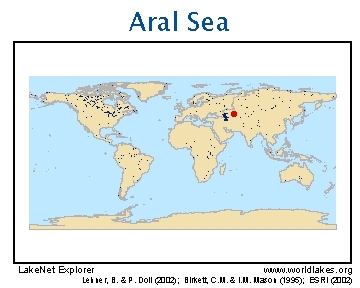 Description The Aral catchment basin spans six countries within Central Asia. 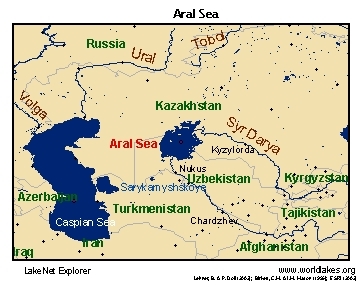 The Aral Sea has two major inflow rivers, the Amu Darya and the Syr Darya. Prior to diversion of its major tributaries, the lake had a surface area of about 62,000 square kilometers. The water volume was 970 cubic kilometers. In recent decades the amount of water from inflow rivers has drastically declined from 60 cubic km to 5 or 10 cubic km per year due to irrigation withdrawals. Economic Value The production of cotton within the Aral Sea region is largely dependent on irrigation. In 1990 a total of 7.9 million ha was irrigated. Increased salinizatioin of irrigated land poses a serious threat to the agriculture sector. A thriving commercial fishery has now been completely destroyed. Description Concerns to create a mechanism for regional collaboration in organizing and financing water resources management have arisen since independence. Recently, the political level of decision related to water and environmental sectors in the region belongs only to the Board of IFAS. The most important issues can by decided only at the meetings of the heads of states followed by their recommendations/approval for IFAS. Issues In addition to irrigation-related problems, open-air biological-weapons tests involving anthrax and other pathogens were performed on the main island in the Aral Sea until the early 1990's. Invasive species have negatively affected the biodiversity of the Aral Sea as well. On the eve of oncoming ecological catastrophe connected with diversions of riverine waters for extensive irrigation development, the Aral Sea had been subject to many exotic species introductions. While biodiversity had increased by fourteen species of fishes and four species of invertebrates, only a few of these species had commercial value or could serve as a food for fishes. Many species of fishes were introduced accidentally and only increased the pressure on the nutritional chain without giving benefits to the fisheries. Monitoring After the collapse of the USSR in 1991, the new states of the region (Kyrgyzstan, Uzbekistan, Turkmenistan, Kazakhstan and Tajikistan) assumed responsibility for dealing with the Aral situation. As the first step - the Interstate Commission for Water Coordination (ICWC) was established in accordance with the “Agreement on collaboration in the sphere of joint water resources management within interstate water sources” dated February 18 1992, and approved by the heads of states on March 23 1993 (ICWC Booklet, 2002). The ICWC is a collective body that manages transboundary rivers and is responsible for: water allocation among countries; monitoring; and preparing preliminary assessment of proposals on institutional, ecological, technical and financial approaches, based on decisions mutually agreed by all sides. Description The latest aspect of the World Bank effort, supported through the Global Environmental Facility (GEF), is the Water and Environmental Management Project (World Bank, 1998, pp. 19-34). It is planned to run from 1998-2003 at a cost of 21.5 USD million. In line with a new emphasis on regional responsibility for the ASBP, the Executive Committee of IFAS is managing the program, with the Bank playing a cooperative/advisory role. Key task are (1) improvement of the management of water and soil salinity related to irrigation practices, (2) development of low-cost, local, on-farm water conservation measures, (3) reduction of the amount of irrigation drainage water flowing back into rivers, (4) strengthening the existing interstate water sharing agreements, (5) improving public awareness of critical water problems, (6) enhancing dam and reservoir management and safety, (7) monitoring of water quality and quantity at transboundary river crossings, and (8) implementing a program to restore wetlands in the lower Amu Dar’ya delta, particularly Lake Sudoch’ye, which is a RAMSAR (wetland of international importance) site.  Aral Sea Experience Brief. Final. 2/27/2006.  Aral Sea (Structure of International Fund - Figure 4) (PDF) Experience Brief. Draft. 6/15/2003.  Managing Lake Basins for Sustainable Use - Lake Basin Management Initiative Final Report (PDF) Project Report. Final. English. 2/27/2006.